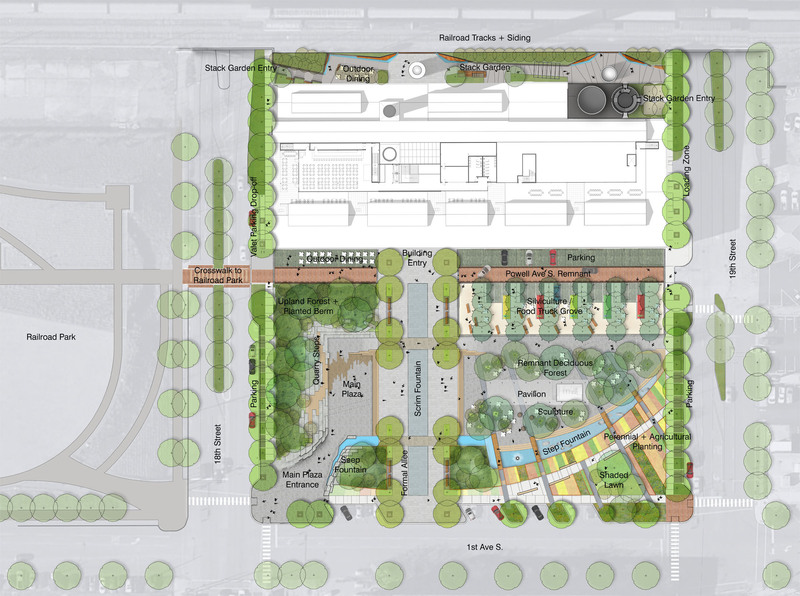 Alabama Power received schematic design approval of its plans for the park and plaza surrounding its Powell Avenue Steam Plant from Birmingham’s Design Review Committee on Wednesday morning, allowing for permits to be secured and work to begin. Nelson Byrd Woltz, a firm with offices in Charlottesville, Virginia and New York City, presented the proposed plans for the Community Foundation of Greater Birmingham’s former Prize 2 the Future site (a.k.a., Lot D) to the committee, meeting the first time since the cycling accident that claimed the life of committee member and local contractor William Robertson on August 29. A report on the company’s Alabama Newscenter website (as well as a post to the project’s website) states construction is expected to begin this fall, taking approximately one year to complete. The approval includes streetscape, furniture, and landscaping for the city block located between 18th and 19th Streets along 1st Avenue South. The plaza’s the main entrance, located on the block’s southwest corner, will mimic the Red Mountain Expressway‘s “cut” using limestone and iron ore and matching the berm height of its existing neighbor to the west. Those materials will be used with sandstone to create a seeping fountain. The resulting main plaza could be used as an amphitheater. A scrim fountain will double as a reflecting pool, lining up with the taller of the steam plant’s two smokestacks and serving as the centerpiece of an allée. A water feature will run through a perennial plant garden along the site’s southeastern edge. The portion of Powell Street passing directly in front of the building, vacated by the city of Birmingham earlier this year, will have bollards installed at its western end. It will still be accessible from 19th Street, providing access to a “food truck grove” and some off-street parking. The plans also call for a small covered pavilion and restrooms. Several sections throughout the site are designated for allowing outdoor dining. A “stack garden” will run along the northern edge of the structure, providing visitors access to a unique, elevated view of the railroad tracks and the surrounding area during business hours. 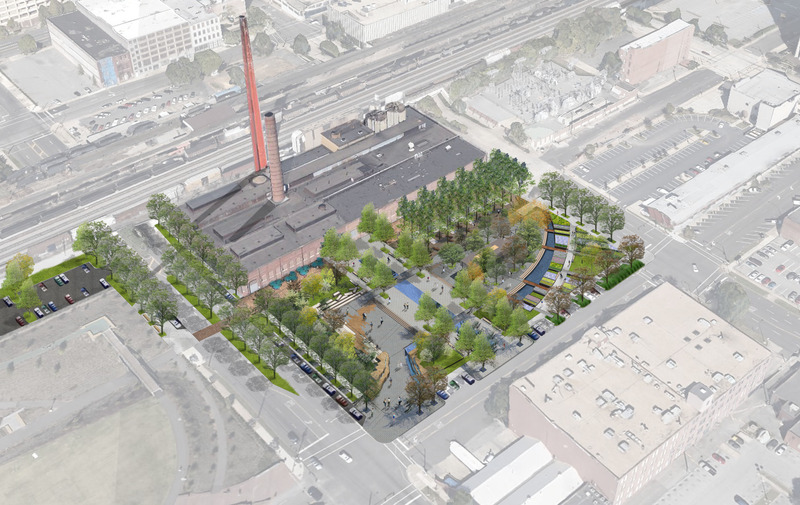 While a rendering showing an overview of the project site shows a landscaped parking lot along the northern edge of Railroad Park, a representative from the utility stated it was included as conceptual. The site does sit immediately south of the intermodal transit facility currently under construction along Morris Avenue. The plan presented today does call for a reduction of parking along 1st Avenue South – partially to accommodate the allée – though the remaining spaces will remain angled.